My neighbor has a laugh to behold. It booms out of her open window, a barking sound of joy with an exclamation point after each syllable. HA! HA! HA! HA! It is a laugh that is produced with the full body, not one born in the back of the throat or even the deep belly, but one that requires help from the toes, the wrists, the shoulders, the thighs to be produced. As I sit outside in the cool shade of my yard, I like to imagine all of that happiness and hilarity and surprise zipping through my neighbor’s veins, coursing up and down her limbs, through her core, before finally being sent out into the air in a thunderclap of expression. Now I don’t actually know this neighbor. My early impressions of her, garnered from her impeccable garden, sleek car, and beautifully maintained house, were of stiffness and disapproval. I pictured her tall and lean, with sharp collarbones and short gray hair. The laugh, when I first heard it, seemed so incongruous with my assumptions that I decided it couldn’t possibly belong to her. No, I decided, it must belong to a boisterous friend of hers who comes to visit often. But as the weather warmed and I started to spend more and more of my evenings outside beneath her open windows, I was forced to conclude that the loose, generous laugh did indeed belong to the lady I had deemed so uptight and formal. After living in my apartment for nearly 9 months, I finally came face to face with my laughing neighbor as I carried my recycling into the backyard. She was neither stern nor severe, but in fact looked like her laugh, full and strong and deep but somehow still light and free. We exchanged a brief greeting and as she smiled slyly at me I wondered if there’s a story that she tells herself about me, built on little details gathered from the strange parts of my life that she sees and hears from her second story home. I wondered what my laugh sounds like to her and if it matches my physical self as well as hers does. These days when I hear my neighbor laugh, I have to laugh too. I laugh at my harsh judgements and the false surety I have in the stories I use to explain myself and others. I laugh because I still don’t know anything about this neighbor, only this one sound she makes when she’s happy. Mostly though, I laugh in appreciation of the goodness that flows out of her window, over the shrubby fence, and into my heart where I hold it for a second before releasing it back into the world from my own lips. HA! HA! HA! HA! In a large bowl, mix together the flour, salt, and sugar. Using your fingers or a pastry cutter, cut the butter into the flour until the mixture resembles coarse sand. Add the water a few tablespoons at a time, mixing gently as you go, and stopping when the dough holds together. Form the dough into a ball, wrap in plastic, and place in the fridge to chill for at least 15 minutes, or up to one week. Meanwhile, heat the olive oil in a skillet over medium heat. Add the onion and sauté until soft and translucent, about 5 minutes. Add the mushrooms and cook for another five minutes or so; then stir in the asparagus, 1 tsp. salt, and the rest of the seasonings. Sauté the veggies for a few minutes longer, until the asparagus is bright green and just slightly soft (think al dente – you don’t want it mushy or raw). Remove from heat, adjust seasonings, and let cool completely. Preheat the oven to 400 degrees. Take the pie crust from the fridge and place on a lightly floured surface. Roll the crust out to a 12" circle and carefully move into your pie dish. Gently fit the crust into the dish, folding the extra edges under and crimping as you like. Return the crust to the fridge for another 5 to 10 minutes. Prick the bottom of the chilled pie crust all over with a fork. Lay a sheet of parchment paper over the crust and fill with pie weights or dried rice/beans. Bake for 10 minutes, then remove the weights and bake for another 7 to 10 minutes uncovered, until the bottom looks dry and the crust a light golden brown. Reduce the oven temperature to 375 degrees. In a medium bowl, beat together the eggs and the milk. Sprinkle in the rest of the salt and a few pinches of pepper. Transfer the veggies into the crust. Sprinkle on 2/3 of the cheese and then pour over the filling. Top with the rest of the cheese. Carefully move the quiche to the oven and bake for 45 minutes, until the crust is a deep brown and the filling is firm. "Some believe it is only great power that can hold evil in check, but that is not what I have found. It is the small, everyday deeds of ordinary folk that keep the darkness at bay. Small acts of kindness and love. Why Bilbo Baggins? Perhaps because I am afraid and he gives me courage." I started baking this bread in early spring in eager anticipation of zucchini season. The recipe works well with both carrots and parsnips and still manages to feel summer-y despite being full of over-wintered veggies. I like to eat it for a quick breakfast, toasted and topped with a bit of salty butter. Preheat your oven to 350 degrees and lightly grease an 8"x4" loaf pan. In a large bowl, mix together the flours, baking powder, baking soda, salt, spices, and sugar. Make a well in the center and pour in the melted butter, maple syrup, eggs, and vanilla, mixing until just combined. Gently fold in the shredded carrots and walnuts. Transfer the mixture into the prepared pan and bake for 45 to 55 minutes, or until a knife inserted into the center of the loaf comes out clean. Five years ago today, I ran my first marathon. It was the spring of my senior year of college and I was feeling restless, in need of a goal, a mission that didn't involve school. Yes, I decided, I would run a marathon and it would be Boston. Not that I needed to specify at the time – in New England, there is only one marathon that matters and it is Boston. Are you running The Marathon this year? people will ask, their attention drifting when you might explain that yes, you are running a marathon this year, but it’s actually in Maine/New Hampshire/Cape Cod. In New England, there is only Boston. And so, that restless spring of my senior year, I started training for a bandit race of Boston. I had a friend who had run as a bandit (without a race number or qualifying time – this was a fairly accepted practice at the time) a few years prior and I decided that would be the most relaxing way to cover my first 26.2. If I got injured, over-worked, too tired, no big deal, I just wouldn’t run. It turns out that for me there is no “relaxing” way to run a marathon. For me, there is no relaxing way to run ANY race, even the little weekly 5Ks at Worcester State where they ignore placing, instead drawing numbers to see who wins a prize. From the beginning, I knew I would run Boston regardless of circumstance, and I jumped into training, making up my own plan as I went. I ran and I ran through Worcester, Holden, Paxton, Leicester, sometimes on my own, sometimes with cross-country teammates. I ran workouts on WPI’s track, hills at Dead Horse, trails at Cascade. I got stronger and faster and more stubborn. Somewhere along the way I decided that I wasn’t going to consume anything with artificial ingredients during the race, so I trained with water and a small stash of dried fruit stuffed into the waistband of my spandex. On Thursdays, I’d wake up before the sun, force down a bowl of granola, and head out for my long run. When I got back, I’d shower, put on my favorite dress in celebration, and dash across campus to class. I remember being hungry, so hungry as I trained. Once after a long run I walked down to the store to grab some groceries and being so ravenous on the way home, I dropped my bags in the parking lot, opened my half-gallon of milk and casually chugged about a quarter of it straight from the container. Soon after that, I instituted a Thursday night baking ritual so that I could satisfy my endless craving for chocolate chip cookie dough. It was, of course, a very dramatic build up to what ended up being a very dramatic race. On the Friday before the marathon, the weatherman predicted sun and temperatures in the 90s. In APRIL. In MASSACHUSETTS. The race directors warned people not to run, offering to transfer their qualifying times to the next year. Don’t run, my mother said. I’ll play it by ear, I told her, meaning I’m sorry but I’m definitely going to run. Marathon Monday dawned just as hot as ever. My boyfriend drove me to Hopkinton and we walked together to the start line. And then I was off and running with the final corral of racers, bat-out-of-hell style. Afraid to look at my watch, I just ran. Apparently, from my dad’s report I blazed through the first few miles at a sub-7-minute pace, but to me it’s all a little fuzzy. I remember the stickiness of the spilled Gatorade at water stops and how my shoes squeaked on the pavement. I remember noticing that I was no longer sweating around mile 10 and feeling goosebumps on my arms. I remember salt forming on my nose, cheeks, and shoulders. I remember running through a sprinkler put out in the road by a gaggle of kids. I remember the cheers from Wellesley College and getting high-fived by people lining the sidewalks. I remember realizing water and dried fruit were no match for 90 degrees and that I was probably going to throw up. I remember feeling more alone than I had felt during my entire life. I was sitting on the curb at mile 23, having just puked whatever was left in my cramped up stomach into the bushes of a beautiful brownstone, when a cop approached. Do you need me to call someone? he asked, glancing at the phone number I had scrawled on my forearm, just in case I really couldn't finish, or couldn’t remember anything after 26 miles. I’m not sure what I responded, probably something along the lines of I know it's not a good idea but just have to finish this, or damn I feel so much better now that I’ve thrown up but regardless, he listened. He handed me a bottle of water, helped me up, wished me luck. I started jogging again, slowly, slowly. I clutched that water bottle, savoring small sips as I ran from mile marker to mile marker. Three more miles, two more miles, one more mile, point 2 point 2 point 2. When I eventually saw the finish line, I burst into tears. I hurt so very badly. I felt so very alone. There is a short story called The Loneliness of the Long Distance Runner and on the day of my first marathon that title echoed over and over in my head. Nobody can help me do this, I remember thinking wildly as I stumbled along, losing speed every mile. I am by myself out here. But I really wasn’t alone at all. In fact, as I made my way from Hopkinton to Boston, I had more people at my back, more people cheering me on, than ever before. I had no legitimate reason to be there running that day, no number, no qualifying time, but people reached out to help me again and again without any hesitation. Running often feels like a selfish pursuit. It takes up time - so much time! - that I could be spending with loved ones, helping others, tackling that endless list of chores, or making some sort of productive contribution to the world that involves far less sweat and pain. I have come to realize, however, that running is neither a selfish, nor a lonesome activity. When I run, I am fueled by the love of all those who support me, who accept that running is a part of me, who root for me in the heat and the rain and the cold and the wind. Running is a team sport and without partners and friends and families and coaches and sweet passersby and the stunning natural world - without love - it just wouldn’t be worth it. When I run, I am never alone. One year later, in 2013, a piece of my heart shattered with the explosions of the bombs on Boylston Street. The Marathon, an endeavor of love, was mauled by hate and scarred by fear. It was a tragedy instigated, in a way, by loneliness. It took me four full years after my first attempt to commit to running a second marathon. This time, I had one clear goal: a qualifying time for the start of a journey back to Boston one day. With my heart full, I wobbled across the finish line in 3:34.02, meeting my goal with less than a minute to spare (and without any puke). As I sat on the ground under the cold Maine sky, legs twitching, I promised my family that I had run my final marathon. I’d rather give birth than do that again, were my actual words I think, but I really meant I love you all, thanks for being here now, and for being there next time. These brownies are my answer to the eternal question, can homemade brownies ever be more delicious than those made from the Ghiradelli box mix? They are my current favorite long run treat and probably a much better choice than the raw cookie dough trend of Boston 2012. Preheat your oven to 325 degrees. Lightly grease or line an 8"x8" pan with parchment paper. Melt the butter and chocolate in a medium saucepan over low heat, stirring frequently. Add the sugar, mix well, and then set the saucepan aside to cool for about 5 minutes. Beat in the eggs and vanilla extract and then stir in the flour and walnuts, mixing until just combined. Transfer the batter to the prepared pan. Liberally sprinkle the batter with sea salt and then bake for 20 to 25 minutes, until the tops of the brownies are wrinkled and barely soft to the touch. Serve warm with softly whipped cream and fresh berries. The snow under my feet squeaks in the 7-degree morning as I leave my front walk and start to run up the hill. My breathing quickens as I climb, climb, climb in the already-blinding blue sky sun. Past the houses, past the open fields, past the small hut, and onto the narrow trail that leads to the forest. It’s quiet here in the trees, where the snow trades its high voice for a lower, softer chant. The light grows more delicate too; it filters down among the pines in narrow columns, sparkling from time to time with snow that dances down from shaken boughs. The terrain eases back to rolling and my pace increases. My fingers slowly emerge from my sleeves and I quiet my breathing. Here in the Ponderosas, the air smells of beeswax – fresh, clean, comforting – and I am buoyed by the scent. Around the sweeping turns I run, rounding corners that open to brightness, clear space. I am gifted views of the flat, endless land below me, hazy and snow-blue in the morning light. I am gifted views of the steep, slab-y mountains above me, glinting pink and gold, wrapped in their winter coats. The yellow grasses peeking from the snow wave their greetings and I smile, good morning. The longer I run, the longer I live, the softer, more open I feel. I breathe in the land and slowly, slowly, it settles into my lungs, my heart. Like the trees, the rocks, the trail, the scrub, I am part of this small stretch of earth where the plains meet the mountains, and it is part of me. It is part of me like the ocean is part of me and the beech forests are part of me and the deeply carved lakes are part of me. Each of these parts make me stronger, more flexible. From here, I am in the ground and in the sky, witness to the magic and the harshness that is the world, the land, before me. I believe in many things, but most of all I believe in Humankind and Earth. The sacred is found in the hearts of our neighbors, in the reach of the mountains, in the song of the sea. I know goodness because I know the sunrise, the stars, the golden hour of dusk. I know fear because I know fire and thunder and cold and anger. I know love because I know the luscious moon and the renewing change of the seasons and the soft embrace of the moss. When my heart is ready, I pause in the open light and turn my face towards the golden warmth of the sun. I can see so much from where I stand; peaks and soft hills and layers of evergreens and frozen streams, with a narrow path winding its way through, winding its way onward. That path holds more goodness and fear and love and I know I will travel further on it soon. For now though, I turn and move down the mountain, my soul quenched by its current path and the morning light. My husband, the same man who makes his own kombucha and cheese, also has a thing for foods straight out of the ‘50s - meatloaf and casseroles in particular. After years of teasing, it turns out that these are foods I may have underestimated. During the cold months, it can be hard to beat a casserole. This one is inspired by my mother’s winter lasagna, with a casserole-y twist for my sweet spouse. We like to make it over the weekend and save if for dinner mid-week when it’s dark and cold and we need something especially cozy. Rub a large baking sheet with about 2 Tbls. olive oil. Place the butternut squash on the sheet and sprinkle it with 1 tsp. salt, ½ tsp. black pepper, ½ tsp. garlic powder, and ¼ tsp. hot pepper flakes. Toss the butternut squash in the spices to make sure everything is evenly coated and then roast for about 25 minutes, or until the squash is soft and a little caramelized at the edges. While the squash roasts, add a drizzle of olive oil to a large skillet over medium heat. Add the onion and sauté for about 5 minutes, until soft and translucent. Add the kale along with ½ tsp. salt and ¼ tsp. pepper and sauté until soft, another 7 minutes or so. Bring 5 quarts of water and a few pinches of salt to boil in a large sauce pot. Add the pasta and cook according to package directions. Drain and set aside. Transfer the kale and butternut to a 9”x13” casserole dish and set aside. In the same skillet you used to cook the kale and onion, melt 2 Tbls. of butter over medium heat. Once the butter starts to sizzle, add the flour and stir well, cooking until you have a thick paste. Pour in about ¼ cup of stock and stir well, until the sauce thickens. Add about ¼ cup more stock and then continue this process until all the stock and milk has been added to the pan and you have a nice, thick roux. Lower the oven temperature to 350 degrees. Add the cooked pasta to the casserole dish with the kale mixture and then top with the roux. Stir well to combine, tasting and then adjusting the seasonings as needed. Sprinkle the top of the casserole with mozzarella, then cover with foil and bake for 30 minutes. Remove the foil and bake another 15 to 20 minutes, until the cheese is well browned. "It was late one winter night, long past my bedtime, when Pa and I went owling. There was no wind. The trees stood still as giant statues. And the moon was so bright the sky seemed to shine. Somewhere behind us a train whistle blew, long and low, like a sad, sad song. I could hear it through the woolen cap Pa had pulled down over my ears. A farm dog answered the train, and then a second dog joined in. They sang out, trains and dogs, for a real long time. And when their voices faded away it was as quiet as a dream. We walked on toward the woods, Pa and I. Our feet crunched over the crisp snow and little gray footprints followed us. Pa made a long shadow, but mine was short and round. I had to run after him every now and then to keep up, and my short, round shadow bumped after me. But I never called out. If you go owling you have to be quiet, that's what Pa always says. I had been waiting to go owling with Pa for a long, long time. Again he called out. And then again. After each call he was silent and for a moment we both listened. But there was no answer. Pa shrugged and I shrugged. I was not disappointed. My brothers all said sometimes there's an owl and sometimes there isn't. We walked on. I could feel the cold, as if someone's icy hand was palm-down on my back, and my nose and the tops of my cheeks felt cold and hot at the same time. But I never said a word. If you go owling you have to be quiet and make your own heat. We went into the woods. The shadows were the blackest things I had ever seen. They stained the white snow. My mouth felt furry, for the scarf over it was wet and warm. I didn't ask what kinds of things hide behind black trees in the middle of the night. When you go owling you have to be brave. Pa almost smiled. Then he called back: 'Whoo-whoo-who-who-whowhoooooooo,' just as if he and the owl were talking about supper or about the woods or the moon or the cold. I took my mitten off the scarf off my mouth, and I almost smiled, too. The owl's call came closer, from high up in the trees on the edge of the meadow. Nothing in the meadow moved. All of a sudden an owl shadow, part of the big tree shadow, lifted off and flew right over us. We watched silently with heat in our mouths, the heat of all those words we had not spoken. The shadow hooted again. Pa turned on his big flashlight and caught the owl just as it was landing on a branch. For one minute, three minutes, maybe even a hundred minutes, we stared at one another. Then the owl pumped its great wings and lifted off the branch like a shadow without sound. It flew back into the forest. 'Time to go home,' Pa said to me. I knew then I could talk, I could even laugh out loud. But I was a shadow as we walked home. When you go owling you don't need words or warm or anything but hope. That's what Pa says. The kind of hope that flies on silent wings under a shining Owl Moon." Santa Lucia buns are one of my favorite December treats and a fitting spark of light in a dark time. I see these buns as being tightly linked to my sister, the guiding light of my childhood, and I can still feel the anticipation and happiness we experienced bringing a basket of them up to my mum in bed when we were little. I hope you have a chance to bake these this winter, maybe in a snowstorm, maybe on a bright blue-skied afternoon, maybe in the early morning darkness by candlelight. Most of all, I hope you have the chance to share them with someone, spreading warmth and hope and kindness from your kitchen into the world. A quick note: Traditionally, Santa Lucia buns are made with saffron, which gives them a beautifully deep gold color and earthy flavor. I've left it out here because (embarrassingly) I don't very much enjoy the taste. However, if you would like to try it, feel free to add a few threads to the milk mixture as you heat it, or throw about 1/8 tsp. of powdered saffron in with the flour. Place the milk, maple syrup, water, and butter in a small saucepan and gently heat on medium until the liquids are warmed through and the butter is melted. Be careful not to let the mixture boil! Set the saucepan aside and let the liquids cool until they feel warm to the touch but not hot. Stir together 2 ½ cups of the flour, the salt, and the yeast in a large bowl. Add the milk mixture and the egg and stir well with a wooden spoon, until you have a loose, shaggy dough. Slowly mix in the last ¼ cup of flour and then turn the dough out onto a clean surface. Knead until smooth and elastic, about 10 minutes. (This process can also be completed in a stand mixer – just put all of the ingredients in the mixer’s bowl and beat with the dough hook for about 6 minutes on low speed, adding in the last 1/4 cup flour a little at a time.) Grease your large bowl with butter, place the kneaded dough inside, cover with a tea towel, and let rise in a warm place for about 1 hour, until the dough has doubled in size. Once risen, turn the dough out onto a clean surface. Divide it into 8 pieces. Roll each piece into a 12” rope and shape into a spiraled “s” shape (see photo above). Place each bun on a baking sheet, cover with a tea towel, and let rise again, this time for 45 minutes. Preheat your oven to 375 degrees. When the buns have completed their second rise, beat an egg and use a pastry brush (or your fingers) to coat the buns. Bake for 12 to 15 minutes, or until lightly golden brown. Nearly six weeks ago I packed up the rest of our things and made the final move to our new home in Boulder, Colorado. It still feels somewhat odd to be here, like my brain hasn't caught up with my body, like maybe it got lost somewhere out there as I flew over the middle of the country. Maybe it's still stuck driving through the gorgeous rolling green of Iowa; maybe it's still teaching science on the rocky Maine coast; maybe it's still cooking away in our sunny Massachusetts apartment. Anyway, the bits of me that are present here seem to think it hilarious that the move actually happened and that my physical space has changed so drastically. I'll hike to a gorgeous alpine lake or see a prairie dog on a run or watch the sunrise on the Flatirons and I'll roar with laughter. What is this amazing, different place? Is it really my home? I spend a lot of time thinking about the way we humans are shaped by the land where we live (I did, after all, marry a geographer). As I walk circles around my new city and kick up red dust on new trails, I consider my own geographic identity and wonder about the definition of home. What parts of home do you feel are most important? Is it the physical or built space where you happen to be living? Is it the people you are with? Is it the environmental space - the trees, water, smells, mountains, ecosystems - that surround you? Is it the physical actions or habits - cooking, sleeping, running, drinking coffee from a certain mug in a certain chair - that you perform daily? Of course, I think I need a little bit of all of these things to truly feel at home, but geographic or environmental space seems to hold a little more weight for me these days. That doesn't mean that I can't feel happy (thrilled! ecstatic! overjoyed!) in a new location - it's really more of a burst of gratitude in knowing that my environmental home is still safe and sound in Maine and that I have the time and space and means to put down roots in Colorado. So, as I work on Settling In, I have come back to this space on the internet after a long stretch away. Between having my kitchen packed in boxes and being too exhausted (er, lazy) at the end of each day, it was a sparse summer for cooking. (Never fear though, the eating was in high gear thanks to the many excellent cooks Nate and I get to call family.) However, when I was inspired in the kitchen, it was because of pastry crust - and I think I baked more pies, galettes, and quiches this summer than I have over the course of my entire life. There were fresh berries, stone fruits, mushrooms, rhubarb, and herbs, and quickly before we admit that fall is really here, I would like to share my favorite savory summery combination yet: burst cherry tomatoes, onions, zucchini, fresh corn, and basil all wrapped up in a thick rye pastry. I'd say it's a solid send off to summer and a giant thank you for a wonderful season of change. Stir together the flours, salt, and sugar in a medium bowl. Slice the butter into ½ - inch cubes and cut it into the flour mixture. I like to use my hands here – I’ll rub the butter into the flour between my fingers until the mixture resembles coarse sand with a few pea-sized chunks of butter still visible. If your body tends to run hot, feel free to use a pastry cutter for this process. Work quickly so that the butter doesn’t start to melt – stick the bowl in the freezer for a few minutes if needed, to ensure your mixture is as cold as possible. Add in the ice water, starting with 5 tablespoons and mixing well. If the dough holds together, form it into a ball. Most likely though, you will need to add a few more tablespoons of water to get a consistent dough. Be careful not to over-mix – just gather it up in your hands and form a ball. Wrap the dough in plastic wrap, flatten it out into a disc, and refrigerate anywhere from 15 minutes to overnight. Heat a few glugs of olive oil in a large skillet over a medium-low flame. Add the onion and garlic and sauté until soft and translucent, about 5 minutes. Throw in the zucchini with several big pinches of salt and pepper and cook until it starts to soften, another 5 minutes or so. Add the tomatoes, corn, and basil to the skillet, cover with a lid, and cook until the tomatoes have burst and the veggies are cooked through. Taste for seasonings, adding in more salt, pepper, and some hot pepper flakes (if you like) as needed. Set the mixture aside to cool completely. Once the filling is at room temperature and the crust is thoroughly chilled, preheat your oven to 425. On a lightly floured surface, roll out the crust into a large circle, about ¼ inch thick. Gently transfer the crust to a baking sheet and mound the filling into the center of the pastry. Carefully fold the edges of the crust up over the filling, pressing the dough firmly to keep the filling from leaking through. Quickly brush the exposed crust with egg wash and then bake the galette until the crust is deep brown, about 35 minutes. Combine the rhubarb, ginger, sugar, and salt in a medium saucepan over medium-low heat. Cook for 5 to 7 minutes, until the rhubarb starts to soften and break down. Add the vanilla and the cornstarch and stir well. Cook for 2 to 3 minutes more, stirring frequently, until the mixture is thick and jammy. Take the pan off the heat and cool to room temperature. Once cooled, stir in the strawberries. Preheat your oven to 400 degrees. On a lightly floured surface, roll out your bottom crust and transfer into a 9” pie plate. Fill the crust with the strawberry mixture and place in the refrigerator to chill for a few minutes. Meanwhile, roll out the top crust however you prefer (my favorite these days is the fat lattice). Take the pie from the fridge and top with your second crust. Paint the top with egg wash, sprinkle liberally with turbinado sugar, and bake until bubbly and deeply browned, about 40 to 50 minutes. *Use your favorite pie crust or another great recipe, like this one. Do I take myself too seriously? I’ve wondered frequently over the years. Probably, was always my first thought, but the more I’ve considered it recently, the more I tend to swing in the other direction: I think that sometimes we don’t take ourselves seriously enough. I don’t mean to say that we shouldn’t laugh at ourselves or learn to let go or try be spontaneous. All of that is important too! What I mean to say is why bother if you don’t care? My lovely boss at a past job had a background on her computer that read “I care about this a lot.” It may have been a reference to something totally unrelated, but it always struck me as important. I did care about that job a lot. I care about my current job a lot, too. I care about my family a lot. I care about my friends, my future, my Earth, my country, my fellow humans, a whole stinking lot! If something really matters to you, you’ll find a way to give it the time it deserves. If you’re not willing to put in the effort on a regular basis, ask yourself: how much do I really care? If it’s not too much, let it go. I take things seriously because they matter to me. I take myself seriously because I’m only here for a short time and tomorrow, next month, next year, the world could be a very different place. What does this have to do with granola bars? Maybe just that I take delicious food very seriously too. Let's make these this weekend and go adventuring. Preheat your oven to 350 degrees. Line an 8 ½ x 4 ½ - inch loaf pan with parchment paper. Place the almond butter, oil, and maple syrup in a small saucepan over medium-low heat. Cook until warmed through and stir to combine completely. In a medium bowl, toss together the oats, nuts, and seeds. Pour the almond butter mixture over the oat mixture and stir well, until evenly combined. Scoop the granola into the prepared pan and press well into all of the corners, using the back of a spoon. Sprinkle with salt. Bake the bars for 20 to 25 minutes, or until the edges are a rich brown and start to pull away from the pan. The mixture in the center might feel just a tiny bit soft – that’s okay. Everything will harden as it comes to room temperature. Let the bars cool completely in the pan on a wire rack, then cut into bars using a very sharp knife. I wouldn't say no to dipping these in dark chocolate, if you're in the mood! In a medium saucepot, bring the vegetable stock to a boil. Add the wheat berries and cook until al dente, about 2 hours (I like to do this the night before, or on the weekend when I have some extra time). Keep in the refrigerator until ready to use. In a large saucepot or dutch oven, sauté the onion in olive oil for five minutes. Add the carrots and sauté for another 5. Add the mushrooms and peppers, cook for 5 more minutes. Add the kale and cook until wilted. Stir in the spices. Add one cup of the cooked wheat berries, and the beans, tomatoes, corn, and stock. Bring to a boil. Reduce to a simmer and turn down the heat to a simmer. Stir in the corn and simmer for ½ hour to 1 hour. While the chili cooks, preheat the oven to 400 degrees and grease a 6- or 12-cup muffin tin. In a large bowl, mix together the dry ingredients, making a well in the center. In a small bowl, combine the yogurt, milk, egg, and maple syrup, and mix well. Add the yogurt mixture and the melted butter to the dry ingredients and stir until barely combined. Gently fold in the corn. Divide into the muffin tins and bake for 15 to 20 minutes, or until a knife inserted into the middle of a muffin comes out clean. 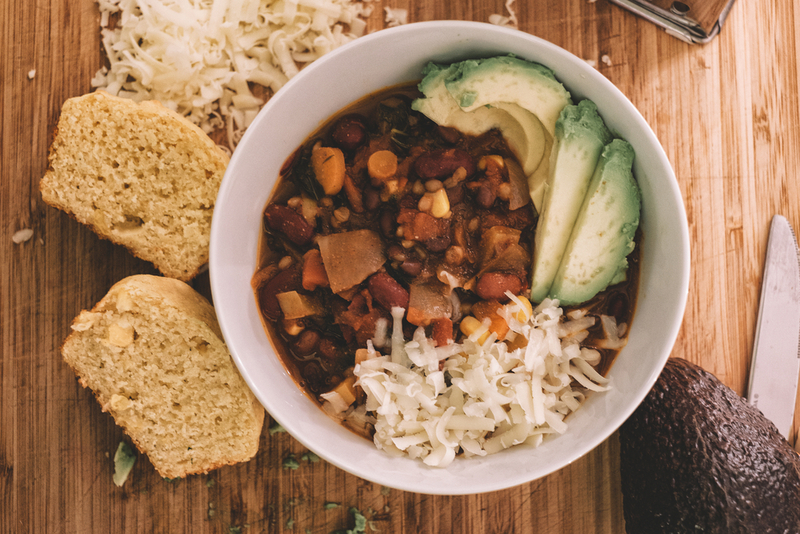 Adjust the chili seasonings and serve with the cornbread, a sprinkle of sharp cheddar cheese, and avocado slices. *Note that this will yield more wheat berries than are required for the recipe. You will only need 1 cup cooked berries for the chili, but because it takes so long to cook them (and because they are so delicious!) I like to make more than necessary and use them throughout the week in other dishes. **Thanks, as always, to Nate for the photos. ***The cornbread recipe is adapted from Smitten Kitchen and Brown Eyed Baker. "You made crusty bread rolls filled with chunks of brie / And minced garlic drizzled with olive oil / And baked them until the brie was bubbly / And we ate them lovingly, our legs coiled / Together under the table. And salmon with dill / And lemon with whole-wheat couscous / Baked with garlic and fresh ginger, and a hill / Of green beans and carrots roasted with honey and tofu. / It was beautiful, the candles, the linen, the silver, / The sun shining down on our northern street, / Me with my hand on your leg. You, my lover, / In your jeans and green T-shirt and beautiful bare feet. / How simple life is. We buy fish. We are fed. / We sit close to each other, we talk and then we go to bed." Valentine's Day, I love you, but everyday love? I love you more. I am happy to celebrate love in the midst of a cold, dark February, but I am overjoyed to appreciate love on any regular Wednesday, Saturday, Thursday, Monday, Sunday, Tuesday, or Friday. In my family, I am lucky that we often celebrate love with food. Not any wimpy food, either. Food that is filled with goodness, food that blows you over with its depth. Bronwyn, if you’re reading this, do you remember when we went to Strasbourg on Valentine’s Day? And drank the most delicious wine and ate the most delicious dinner in that tiny alley restaurant? I’m still dreaming about it. We re-create that meal almost every weekend in our home now, though admittedly with less cheese and less sausage (but only because it's more difficult to find cheese and sausage of the same heart-breakingly delicious variety). Really, we just go for that feeling of joy because I think that nourishment, just like love, should be a celebration. And one not just saved for special occasions. Love, and food, should be a celebration of everyday. (But this is coming from someone who has nightmares about the taste of fake maple syrup. So maybe take this with a grain of salt, yeah?). Happy February, happy love, friends! Place the almonds in the bowl of a food processor and pulse several times, until the nuts turn into coarse flour. Be careful not to over mix – you’ll make almond butter! Using a stand or handheld electric mixer, cream the butter on medium speed for about 2 minutes, until light yellow and smooth. Add in the sugars and beat again on medium until the mixture is light and fluffy, another 2 minutes or so. Stir in the vanilla. Add the almond flour to the mixture and stir until just combined. Gently stir in the all-purpose flour in two batches, stirring until just combined after each addition. The dough is going to feel very crumbly here, but it should hold together. Using your hands, turn the mixture onto a clean surface and separate into two discs. Wrap each disc in plastic and refrigerate for 30 minutes. Preheat your oven to 350 degrees and line a cookie sheet with a silicone mat or parchment paper. Then, go hunt down your favorite cookie cutters. You’ll need two concentric shapes – one larger shape to act as the base, and one smaller shape to make the top window. I don’t have any heart-shaped cutters at the moment, so I just made my own cookie stencils from cardboard. Take one of the cookie dough discs from the fridge and roll out to about a ¼” thickness on a lightly floured surface. The dough will be pretty delicate, but feel free to close up any cracks that might form with your fingers. To make your base cookies, use the larger of the two cookie cutters to cut out as many shapes as you can. Gently transfer the dough shapes to your cookie sheet using a spatula, and bake for 10 minutes, or until the edges are lightly golden. Careful not to over bake! Re-flour your work surface and roll out the second disc of dough. Use the large cookie cutter to cut out as many shapes as you can, and then use the small cookie cutter to cut small windows in the middle of each large shape. Bake for 10 minutes. When the cookies come out of the oven, place of a wire rack and let cool completely. Once cool, spread a layer of jam on the flat side (what we’d usually consider to be the bottom) of each base cookie. Dust your windowed cookies with powdered sugar and gently place on top of the jam-covered bottoms to make a sandwich. ***This recipe is inspired by Ina Garten and photo credit goes to that talented man, Nate. I've heard it described before as the Peanut Butter Principle*. You know, when you take a good look at life and wonder how in the world that person or structure or family or system is still standing when math, when science, when hope are all against it? What exactly is holding it together? What is it that somehow makes it all okay in the end? In a Tom Robbins-ish way, I like to think of it as magic. Not magic in the casting spells, bubbling potions kind of sense, but rather magic in the sense of a little extra mysterious good in the air. Magic as in a knowing and trusting that the stars hidden behind a blinding darkness will eventually, one night, bring light. Magic as in being beaten down by hate but still choosing love. I like to think of it as magic because in a silly way, like peanut butter, it makes it all easier to explain. But really? Magic is just my word for human strength and love and goodness (and maybe just a touch of coincidence and pig-headedness). It is not a fairy godmother who keeps hurt at bay, nor is it a Tomten who keeps the proverbial barn from falling in a storm. In the end, isn't it just us, simple human beings and our choices, that make or break the day? We are the ones who lift each other up. And where do we find the strength to keep on walking through pain and sadness and despair and fear? We find it in our hearts and souls where we've been slowly growing it, with the help of mums and friends and dads and strangers and wives and teachers and husbands and poets. In the end, we are what somehow make it all okay. *I do believe that this term was coined by the talented Jud Caswell. Please go listen to him sing much more eloquently on the subject of Holding it Together here. And, if you're in Maine, go hear him play! Please be warned – these muffins are not dainty or delicate. They are not a fluffy cloud of pastry to carry you through the first hour of your day, but more of a hefty pillar on which to rest your 15-mile run, work in the garden, or raucous morning in a first grade classroom. Chocolate chips are optional, but highly recommended. Preheat the oven to 350 degrees and grease a 6-cup muffin tin*. Place walnuts in a small pan and toast in the oven until golden and fragrant, about 8 minutes. Meanwhile, in a medium bowl, combine the flour, oats, salt, and baking powder. In a large bowl, mix together the bananas, oil, maple syrup, and vanilla extract. Add eggs, one at a time, beating well after each addition. Gently add in the dry ingredients, mixing until just combined. Stir in the walnuts and chocolate. Scoop the batter into the muffin, filling each home 3/4 of the way full. 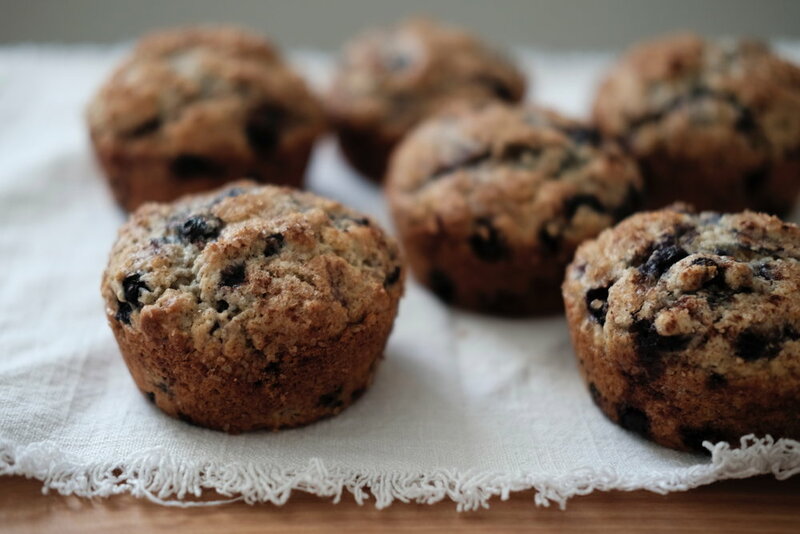 Sprinkle each muffin with oats and turbinado sugar and bake for about 25 minutes, or until a sharp knife comes out with only a few moist crumbs attached. *We like to use our 6-cup tin here and make fewer, larger muffins. Feel free to use a standard tin to make 12 more manageable muffins, if you prefer. If that doesn’t do it, put on a red dress. I am back to work after an exquisite week of quiet freedom and it's hard not to feel the mulleygrubs lurking at the edges of my days. Each afternoon, I've come home a stressed, snappy mess and Nate, the patient, wonderful man he is, gently sends me off with the dog to walk the sunset fields at Shaw Farm. Forty minutes later, I'll return, soothed and revived. Nate knows that my mulleygrubs are cured outside, in quiet movement. How does Nate shake his own blues? He spends hours in the kitchen, cooking homey, rustic recipes. He's able to find a balance of calm and energy there, slowly turning stress and frustration into deep, wintry, warm meals. This chicken soup is one of Nate's surefire cures and we hope it brings you joy and the lift you need to leave your mulleygrubs behind. One of the most important lessons I've learned from watching Nate in the kitchen is to be brave. 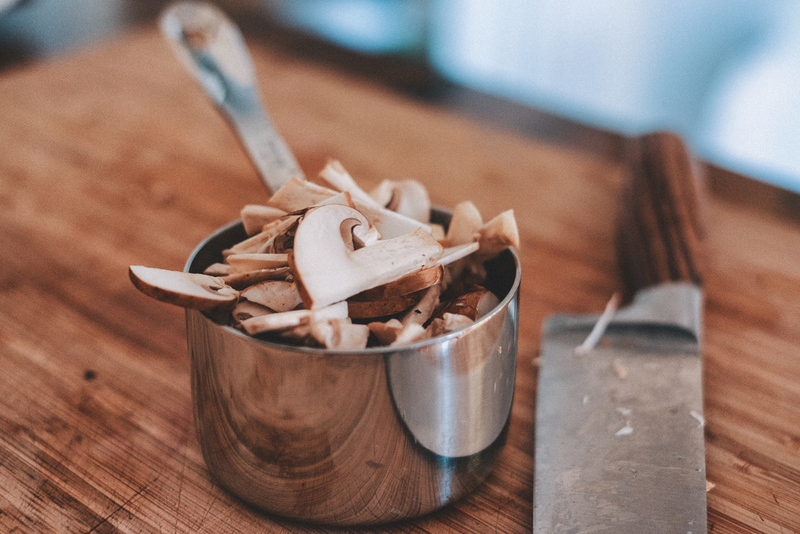 There are so many parts of cooking that always seemed way too scary to consider doing on my own. Cooking meat as a former vegetarian? Terrifying. Making croissants? Um, I think I'll leave that to the professionals. But Nate? He just does it without a second thought and his easy sureness helps me believe that I can do it, too. While I'm still working on truly embodying that confidence, I promise you that the somewhat frightening, long-winded recipes are usually worth it (and often way easier than you think). In that vein, please don't be put off by the time commitment of the recipe below. This soup can easily be made over a few evenings or done all in one cozy home day when you have nowhere to be. Deboning a chicken? Making your own broth? No problem. 1 whole chicken, about 5 lbs. Preheat your oven to 400 degrees. Rinse off the chicken under cool water and pat dry. Place the chicken in a cast iron skillet or roasting pan, rub with olive oil, and sprinkle with a few big pinches of salt and grinds of pepper. Roast the chicken for about 1 hour and 25 minutes (start checking for doneness after about 1 hour and 15 minutes) and then remove the pan to a rack and let the meat cool completely. Once cool, debone the chicken (aka cut all of the meat away from the bones). Place the meat in a large bowl off to the side and put the bones and giblets into a large soup pot. Discard the gristle and fat as you go. Add the carrots, onion, peppercorns, bay leaves, and thyme to the soup pot, and fill about ¾ of the way full with water (you should leave about 2 inches at the top of a 16 qt. soup pot). Cover the pot and bring to a boil over medium high heat. When the stock starts to boil, turn the heat down to low and let simmer until the liquid reduces by 1/3. Be patient! This will take about 3 hours. When the stock is dark and fragrant and fully reduced, strain the broth into a clean pot. Discard the bones, giblets, and stock veggies. If the stock seems too oily, strain again, this time through a clean tea towel or cheesecloth over a fine mesh sieve. In the same pot you used to cook your stock, warm a few glugs of olive oil over medium heat. Add the onion and cook 5 minutes. Stir in the carrots, potatoes, chicken, salt, and garlic powder. Add your stock to the pot and bring to a boil. Reduce the temperature and simmer for 10 minutes, before stirring in the wild rice. Let simmer 30 minutes longer until the rice is fully cooked, adjust your seasonings, and enjoy with a green salad and some fresh bread. Photos for this post were taken by my talented husband, Nate.